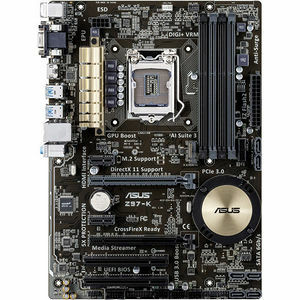 This motherboard supports Intel® 4th , New 4th and 5th Generation Core™ i7/i5/i3/Pentium®/Celeron® processors in the LGA1150 package, with iGPU, memory and PCI Express controllers integrated to support onboard graphics output with dedicated chipsets, 2-channel (4 DIMM) DDR3 memory and 16 PCI Express 3.0/2.0 lanes. This provides great graphics performance. The Intel® Z97 Express Chipset is a single-chipset design that supports Intel® LGA1150 4th, New 4th & 5th Generation Core™ i7/Core™ i5/Core™ i3/Pentium®/Celeron® Processors. It provides improved performance by utilizing serial point-to-point links, allowing increased bandwidth and stability. Additionally, Z97 provides a maximum 6 USB 3.0 ports, 6 SATA 6Gbit/s ports and 10Gbit/s M.2 support for faster data retrieval. Moreover, the Intel® Z97 Express Chipset also supports iGPU functions, letting users enjoy the latest Intel integrated graphics performance.